Finland's government is planning to tighten gun laws after nine people were killed in a school shooting spree. Under the plan, minors would be banned from buying guns but would be allowed to use them under adult supervision. Currently, 15-year-olds can buy guns with parental permission. Finland has the world's third highest rate of gun ownership according to a recent survey. A student, 18, killed eight people and fatally wounded himself at his school in the town of Tuusula on Wednesday. The shooting shocked Finland, which has low levels of violent crime despite the high rate of gun ownership. According to the Small Arms Survey, based in Geneva, Switzerland, only the US and Yemen have more firearms per capita. Hunting and shooting are popular in Finland and the country has until now resisted pressure to bring its gun laws into line with the rest of Europe. "The cabinet is ready to agree on a proposal which says that those under 18 years old can use a gun only under parental or adult guidance," said cabinet spokeswoman Sanna Kangasharju. Pekka-Eric Auvinen opened fire in Jokela High School with his .22 calibre pistol on Wednesday as students were about to start their lunch break. 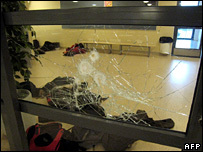 Six students and two members of staff, including the female head teacher, were killed before Auvinen shot himself in the head. He was taken to hospital with critical injuries and died later. Police have found a suicide note he left where he explained his hatred towards society, police said. He also gave a warning of the shooting in a video posted on the internet. Police said Auvinen had apparently selected his victims at random but had been intent on causing maximum damage. Auvinen obtained the licence for his pistol on 19 October, police said.